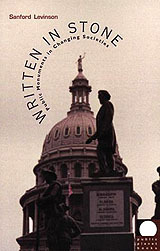 Book review: "Written in Stone: Public Monuments in Changing Societies"
This review first appeared in the September 5-6, 1998 issue of American Reporter. Public statues are, in spite of their inherent attempt to memorialize, rather invisible. Or at least the process that puts them up in public space is rather invisible. Who decides which statues will go where, who they will depict, which causes shall be remembered and in what light  that all kind of gets forgotten once the monument is in place. Professor Sanford Levinson of the University of Texas uses his new book to explore the way in which statues get put up  and, increasingly, taken down. It's an interesting topic that gets a bit sidetracked by Levinson's wandering focus and an overly academic tone. To the issue of focus: Levinson starts off the book looking at the way Eastern European nations are dealing with Soviet-era monuments. Levinson's exploration of how some nations preserve them as historical markers while others are destroying them as catharsis is both educational and enjoyable reading. Halfway through the book, though, he changes gears and decides to focus on the American South and the racial overtones of monuments to the Confederacy. Again, this is a fascinating topic  ranging from the flying of Confederate flags over Southern state houses to the placement of a statue of black tennis great Arthur Ashe alongside those of white Confederate leaders in Virginia. But without a larger, overarching vision for the book, the two halves seem to simply co-exist. There's nothing to tie them together except a too-short conclusion about the role of a changing public consensus in determining which monuments stay up. As to tone: Levinson is actually better at writing in simple, comprehensible language than many academics. And, perhaps, "Written in Stone" isn't intended for a popular audience  although given the importance of its topic, it should be. Regardless, can there really be an excuse for the following passage? "It is at this point that the issues raised by contemporary postmodernism become so relevant: One of the issues hovering over this entire debate is the hermeneutics of culture and the presence of sufficient interpretive clarity to say with confidence that what theorists might refer to as the flag-as-signifiers refers to a unique signified (i.e., the system of chattel slavery)." Say what? Passages such as this suggest a book is needed on why American college faculties are so incapable of communicating clearly with the larger society that supports them. If you can dig through that kind of mind-numbing jargon, though, "Written in Stone" is a thoughtful book about who chooses our public monuments and the values they represent. Again, though, it is incomplete. Quite frankly, the book needed to be longer. Levinson could have written a truly great book on this topic, and it would have been interesting to see more cultures and their monuments included.